A mid-sized chisel roll for the person who needs a broad selection of chisels. This set includes 7 sizes, 5/16”, 3/8”, 7/16”, 1/2”, 5/8”, 3/4”, and 7/8”. Packed in a heavy duty vinyl tool roll. 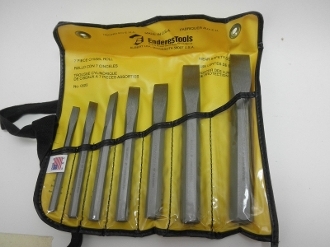 Made from the finest tool steel this set will last for years. Proudly made in America for over 100 years.